The Architeture of Privacy - a book about Privacy Engineering. Decisions made by engineers can unleash technology upon the world that can significantly affect fundamental rights. In some cases, this can yield positive outcomes such as the creation of new platforms to exchange ideas that catalyze change in the world’s most oppressive regimes. In other cases, new technologies can become tools of repression and control, enabling governments and corporate interests to track and manipulate individuals with surprising subtlety and at remarkable scale. With such high stakes, it must be in the interest of more than just lawyers and bureaucrats to recognize, promote, or guard against these potential outcomes as needed. This book is, in part, an effort to empower the engineer. Successful technology is not just technology that works; it is technology that works while simultaneously offering capabilities that protect privacy and civil liberties. Readers of this book will not have to watch helplessly as their technology is misused, nor will they have to wait for others to try to curb that misuse. Instead, they will have the tools to recognize potential risks and design against them, sparing much headache and heartache. This book is distinctive in the realm of privacy literature as it is written by technical authors who approach privacy and civil liberties from what is currently a highly atypical perspective: how to engineer technologies that will deliver trustworthy safeguards capable of supporting liberal-democratic principles. By contrast, most privacy books are written by professional scholars who take law and policy as their starting point and treat technological concerns as ancillary at best and menacing at worst, which is hardly a perspective that will encourage the engineers of the world. But this book is not just for engineers. For the non-engineers who read this book — the academics, lawyers, and policymakers — we offer a new perspective. The policy choice is not simply to build or not to build, to ban or not to ban. Instead, these readers will find that engineers can offer an arsenal of technical tools that can form the building blocks of nuanced policies that maximize both privacy protection and utility. This book provides a menu of what to demand in a new technology. Courtney Bowman has been working in the data analytics space for the last decade. He joined Palantir Technologies in 2010 as an in-house Privacy and Civil Liberties specialist. Within that role, he has developed extensive experience working with local and federal government agencies (including law enforcement, criminal justice, health, and social services) to develop technology-driven solutions to information sharing and interagency cooperation in a manner that respects applicable privacy, security, and data integrity requirements. As you might imagine, he eschews social media. Ari Gesher is a technologist and software generalist who has split his career between systems engineering, software engineering, and writing and speaking about the uses and impacts of data analysis technologies. In his 17-year career, he’s worked at a number of startups, was the maintainer of the SourceForge.net open source software repository before the word “GitHub” existed, and joined Palantir as a very early engineer in 2006 (after dropping out of his undergrad education at the University of Illinois for a second time). Currently, Ari leads software engineering at Kairos Aerospace. John K. Grant is a Civil Liberties Engineer at Palantir Technologies. He served for nearly a decade as an advisor in the U.S. Senate. He earned his law degree from Georgetown University shortly after joining the staff of the Senate Homeland Security and Governmental Affairs Committee. Daniel Slate has worked at the nexus of privacy, technology, and security for the past six years. At one time a researcher for former cabinet-level national security officials, he has also worked as an engineering strategist and product manager for Palantir Technologies, where he focused on architecting privacy-safeguarding software for the international security community. He studied at Stanford University and splits his time between Northern California and Jerusalem. Elissa Lerner is a writer and editor based in New York. She's a senior editor at The Brooklyn Quarterly, and her work has appeared in The New Yorker, The New Inquiry, The Hairpin, ESPN Magazine, and Duke Magazine, among others. She produced her play, Abraham's Daughters, at the New York International Fringe Festival. She received her M.A. In Journalism and Religious Studies from New York University. She has a lot of thoughts about religion, journalism, theater, technology, and privacy, and believe it or not, they even intersect sometimes. Find more of her work at elissalerner.net. 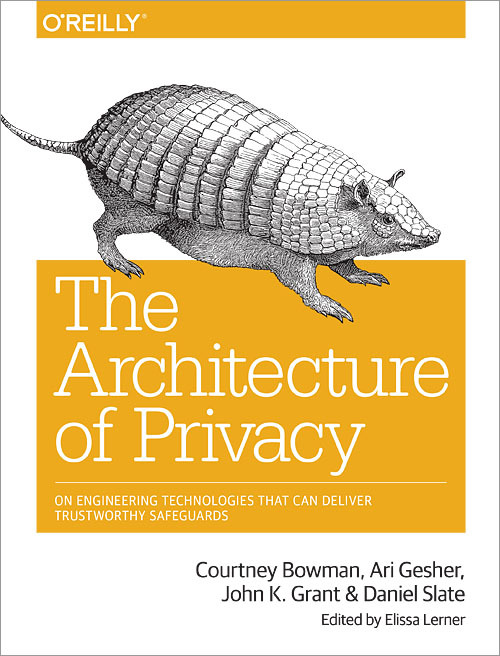 The animal on the cover of The Architecture of Privacy is a six-banded armadillo (Euphractus sexcinctus), also known as the yellow armadillo. Native to South America, this species inhabits the savannahs and grasslands of Argentina, Bolivia, Brazil, Paraguay, Suriname, and Uruguay. 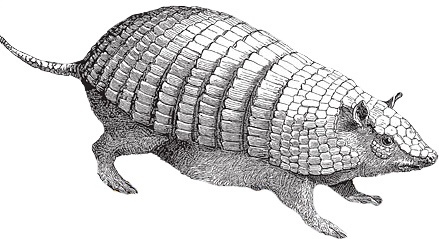 The word armadillo means “little armored one” in Spanish, a reference to the bony plates that protect the animal’s head and body. E. sexcinctus is typically yellow or reddish-brown in color, with a pointed head, short legs, and six to eight moveable bands between its armor plates. It is the second-largest armadillo species, measuring up 30 inches long and weighing about 15 pounds. A close relative of both the sloth and the anteater, it has sharp claws that make it adept at digging burrows. The yellow armadillo is omnivorous, subsisting mostly on plant matter as well as insects. Due to its poor eyesight, it relies on its keen sense of smell to locate food. It is also diurnal, in contrast to most other armadillo species. The cover image is from Wood’s Animate Creation. Copyright © 2015 Courtney Bowman, Ari Gesher, John Grant, Elissa Lerner, and Daniel Slate. All rights reserved.